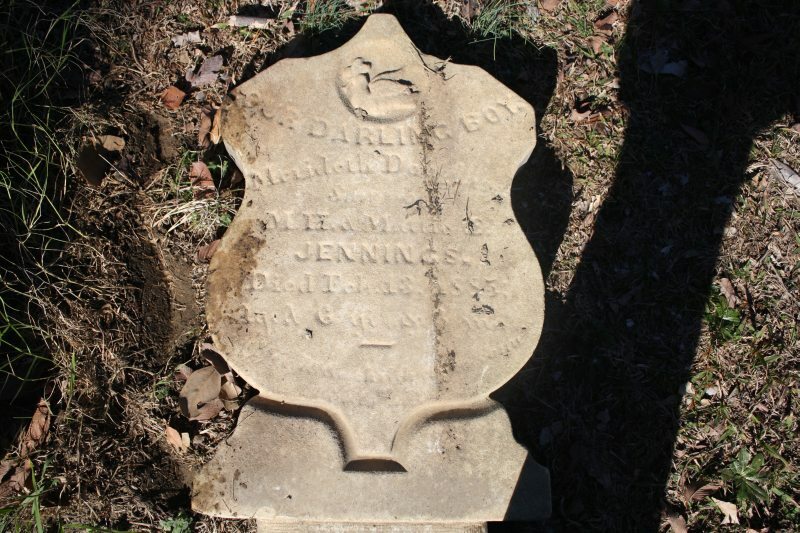 Douglas Jennings’ headstone in Green Hill Cemetery was toppled over and buried face-down in the soil when I found it. After taking this photo I returned it to the position in which it was found. Perhaps the lack of exposure to the elements is what caused the inscription and dove design to remain in this decent quality over the years. Douglas, whose first name I could not read on the tombstone, was born in 1879 to M.H. & M.E. Jennings. In Green Hill’s Mortuary Report he is referred to only as “Douglas” and at six years of age he lost his life to scarlet fever. Douglas was one of the five people buried in Green Hill in February 1885 from scarlet fever, which is impressive when you take into account that there were only 11 people interred in that graveyard that month.